To prepare turkey, remove giblets and neck; reserve for another use. Place turkey on a broiler rack on a broiler pan. Starting at neck cavity, loosen skin from breast and drumsticks by inserting fingers, gently pushing between skin and meat. Combine 3 tablespoons rosemary, rind, salt, and 2 teaspoons pepper in a small bowl. Rub rosemary mixture under loosened skin. Tie ends of legs with kitchen string. Lift wing tips up and over back; tuck under turkey. Loosely cover, and refrigerate 8 hours or up to 12 hours. To prepare glaze, combine marmalade, juice, 1 teaspoon rosemary, vinegar, butter, and 1/4 teaspoon pepper in a small saucepan; bring to a boil. Reduce heat; simmer 4 minutes or until slightly thickened. Set aside 1/4 cup. 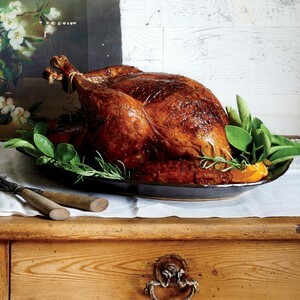 Remove turkey from refrigerator, and pat dry with a paper towel; let stand at room temperature 1 hour. Bake at 220° for 30 minutes or just until beginning to brown. Rotate turkey; add 2 cups water to bottom of pan. Reduce oven temperature to 190°. Cook turkey an additional 60 minutes. Remove turkey from oven; baste with reserved 1/4 cup orange mixture. Bake an additional 15 minutes or until thermometer inserted into thickest part of thigh registers 165°. Remove turkey from oven. Cover loosely with foil; let stand 30 to 60 minutes. Carve turkey; drizzle with remaining 1/4 cup orange marmalade mixture.